How many times have you gone to a family Thanksgiving dinner and the turkey was dry or unappetizing? If it was once, that’s one too many! If it’s your turn to host the holiday, don’t make the same mistake: With the following turkey tips, you’ll serve up a perfectly juicy bird — sure to impress for many holidays to come. Every year, there is some crazy new way to cook a turkey. Remember the deep-fat-fried turkey a few years ago? Sure, it made for brown and crispy skin — but it also led to some brown and crispy homes that burned down from oil mishaps. The bottom line: Keep it simple. Meat thermometers are oven-safe and start around $5. 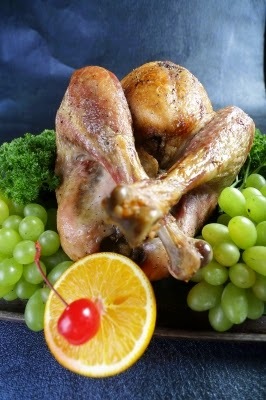 Undercooking your bird may lead to food poisoning, while overcooking it will ruin the dinner. To ensure your meat is cooked properly, insert the cooking thermometer into the thickest part of the thigh to make sure that the meat reaches 165 F.
Just like the old tortoise and the hare fable, slow and steady will win the race. By cooking your bird at 350 F for several hours, you can safely bet that it will come out flavorful and juicy. And don’t forget to preheat the oven! Keep these additional tips in mind and your Thanksgiving dinner will be one the family will talk about — in a good way — for years to come. Check that the stuffing is sufficiently cooked. Like the turkey, it should reach a temperature of 165 F.
up to 30 minutes to allow the juices to redistribute throughout the turkey. It makes for juicy meat and easier carving. Believe it or not, basting is not necessary. However, it does promote that golden brown color we all love. Cook your turkey covered for all but the last 45 minutes to allow the skin to brown and become crispy. Don’t be afraid to infuse garlic, herbs or seasonings into the meat of the turkey. You can do this by cutting small slits in the raw meat and pushing the seasonings in with your thumb. There are also products you can buy that will do the same thing. Jason Carpenter loves to tackle DIY projects on weekends; his work has appeared in This Old House, Men’s Health, Consumer Reports and other publications that appreciate good tips and tools. We have one and it works great for prepaing your turkey dinner. Thanks for stopping by, Sue. Have a great weekend!